Now that Memorial Day is behind us, warmer days are ahead. It also means we’ll be outdoors longer enjoying the great weather. That extra perspiration and exposure to the grime of air pollutants will wreak havoc on our skin. For one, the extra oil that our skin releases can clog our pores. Combine that with a day’s worth of dirt build-up and it means we’d be foolish to not be more diligent about taking care of our face. I’ll be the first to admit, in the past, whatever was near the sink when it was time to wash my face is what I used. Most of the time, that was soap, which can strip the face of its natural moisture. But recently, I’ve been paying more attention to what I use and the results are noticeable. One product in particular that I’m happy I began using is Lierac Homme’s Nettoyant Purifant. It might be hard to pronounce but never mind that. This Micro-Exfoliating Facial Foaming Cleanser works up a good lather while removing dirt build-up and leaving behind nutrients and natural oils for a refreshed appearance. Its micro-exfoliating beads are gentle enough for everyday use and really prep the face for a smooth shave. I have noticed less in-grown hairs since using it. Prior to this, if I remembered, I’d exfoliate every few days. But with this product, I don’t have to think about doing something else to get my face ready. It’s a no-brainer. 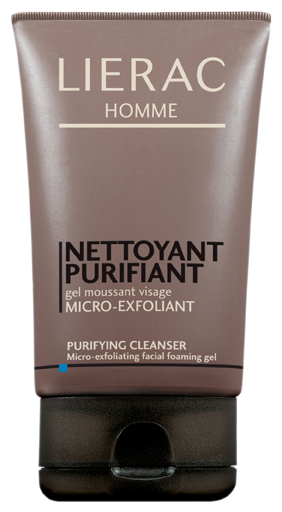 Lierac Homme’s Nettoyant Purifant is recommended for all skin types and for $13, it’s a worthy investment. This entry was posted in Grooming, Product review and tagged Facial cleansers, Grooming, How To, Lierac Homme, Men's grooming, Shaving, Skin, Summer cleansing tips. Bookmark the permalink.